Conflict and Collaboration: For Better or Worse (Routledge, May 2018) - Edited by Catherine Gerard and Louis Kriesberg. Scholars from various academic disciplines join together to examine the overlapping domains of conflict and collaboration studies. This book claims that conflict and collaboration can be good, bad, or benign. Perspectives in Waging Conflicts Constructively: Cases, Concepts, and Practice (Rowman & Littlefield, 2017) - Edited by Bruce W. Dayton and Louis Kriesberg. This book explores how large-scale conflicts can be waged more constructively. An introduction presents key concepts in positive conflict resolution, and chapters from esteemed contributors illustrate these theories in action, with cases ranging from Israel to North Korea. The book offers diverse perspectives and concrete ideas for positive change. Eating, Drinking: Surviving The International Year of Global Understanding - IYGU (Springer Briefs in Global Understanding, 2016) - Editors: Peter Jackson, Walter E.L. Spiess, Farhana Sultana. This publication addresses the global challenges of food and water security in a rapidly changing and complex world. The essays highlight the links between bio-physical and socio-cultural processes, making connections between local and global scales, and focusing on the everyday practices of eating and drinking, essential for human survival. Louis Kriesberg: Pioneer in Peace and Constructive Conflict Resolution Studies Series: Pioneers in Arts, Humanities, Science, Engineering, Practice, Vol. 1 (Springer, 2016) - Author: Louis Kriesberg. On the occasion of his 90th birthday Louis Kriesberg provides an informative account of his career, tracing the trajectory of his discoveries, contributions, and stumbles as he sought to help the advance toward a more sustainable and just peace in the world. Constructive Conflicts: From Escalation to Resolution (Rowman & Littlefield Publishers, 2016)- Edited by Louis Kriesberg and Bruce Dayton. Constructive Conflicts provides a framework for analyzing social conflicts of all kinds, with emphasis on how conflicts can lead to positive change. It introduces key principles, examines the many factors that cause social conflicts to move more or less constructively through a series of stages, and pays increased attention to the significant role of social movements and non-governmental organizations as conflict actors. 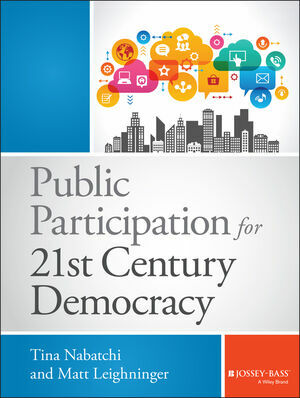 Public Participation for 21st Century Democracy (Jossey-Bass, 2015) - Authors: Tina Nabatchi and Matt Leighninger. This book explores the theory and practice of public participation in decision-making and problem-solving. It examines how public participation developed over time and explores the use of participation in various arenas. It offers a practical framework for thinking about how to engage citizens effectively, and clear explanations of participation scenarios, tactics, and designs. Finally, the book provides a sensible approach for reshaping our participation infrastructure to meet the needs of public officials and citizens. Jerusalem: Conflict and Cooperation in a Contested City (Syracuse University Press, 2014) - Jerusalem is one of the most contested urban spaces in the world. It is a multicultural city, but one that is unlike other multiethnic cities such as London, Toronto, Paris, or New York. This book brings together scholars from across the social sciences and the humanities to consider how different disciplinary theories and methods contribute to the study of conflict and cooperation in modern Jerusalem. Several essays in the book center on political decisionmaking; others focus on local and social issues. While Jerusalem’s centrality to the Israeli-Palestinian conflict is explored, the chapters also cover issues that are unevenly explored in recent studies of the city. These include Jerusalem’s diverse communities of secular and orthodox Jewry and Christian Palestinians; religious and political tourism and the "heritage managers" of Jerusalem; the Israeli and Palestinian LGBT community and its experiences in Jerusalem; and visual and textual perspectives on Jerusalem, particularly in architecture and poetry. Adelman and Elman argue that Jerusalem is not solely a place of contention and violence, and that it should be seen as a physical and demographic reality that must function for all its communities. Democracy and Conflict Resolution: The Dilemmas of Israel’s Peacemaking (Syracuse University Press, 2013) - Miriam Fendius Elman’s new book, co-edited with Oded Haklai and Hendrik Spruyt, considers the understudied impact of domestic factors on the Israeli-Palestinian conflict. Using the contested theory of "democratic peace" as a foundational framework, contributors explore the effects of a variety of internal influences on Israeli government practices related to Israeli-Palestinian peacemaking: electoral systems; political parties; identity; leadership; and social movements. Most strikingly, Democracy and Conflict Resolution explores the possibility that features of democracy inhibit resolution to the conflict, a possibility that resonates far outside the contested region. In reflecting on how domestic political configurations matter in a practical sense, this book offers policy-relevant and timely suggestions for advancing Israel’s capacity to pursue effective peacemaking policies. Environmental Policy Is Social Policy – Social Policy Is Environmental Policy: Toward Sustainability Policy (Springer, 2013) - Isidor Wallimann has published an edited volume which argues that, if sustainability is our goal, social and environmental policy must be treated as one and the same field. Drawing examples from agriculture, nutrition, forestry, urban planning, care work, tourism, and university management, the book aims to increase the awareness that environmental policy has social policy outcomes and is of direct relevance to social policy. Its trans-disciplinary perspective lays a foundation for reorganizing and merging social and environmental policy administrations, and will help professionals and students appreciate the centrality of trans-disciplinary thought and practice in working toward sustainability. Wallimann is a Visiting Research Professor with PARCC at the Maxwell School of Syracuse University. He is based in Basel, Switzerland, where he serves as president of the Social Economy Network Cooperative and of the Urban Agriculture Basel Network Association. Democracy in Motion: Evaluating the Practice and Impact of Deliberative Civic Engagement (Oxford Univ. Press, 2012) - Tina Nabatchi has published an edited volume with John Gastil, G. Michael Weiksner, and Matt Leighninger, addressing the big questions of deliberative civic engagement. Although the field of deliberative civic engagement is growing rapidly around the world, our knowledge and understanding of its practice and impacts remain highly fragmented. Democracy in Motion represents the first comprehensive attempt to assess the practice and impact of deliberative civic engagement. The volume is organized in a series of chapters that use theory, research, and practice from around the world to explore what we know, how we know it, and what remains to be understood. More than a simple summary of research, the book is designed to be accessible and useful to a wide variety of audiences, from scholars and practitioners working in numerous disciplines and fields, to public officials, activists, and average citizens who are seeking to utilize deliberative civic engagement in their communities. The book significantly enhances current scholarship, serving as a guide to existing research and identifying useful future research. It also has promise for enhancing practice, for example by helping practitioners, public officials, and others better think through and articulate issues of design and outcomes, thus enabling them to garner more support for public deliberation activities. In addition, by identifying what remains to be learned about public deliberation, practitioners and public officials may be inspired to connect with scholars to conduct research and evaluations of their efforts. "Spoilers of Peace and the Dilemmas of Conflict Resolution" - This joint publication, edited by Prof. Miriam F. Elman and Dr. Nimrod Goren, was produced through a partnership between Mitvim and the Program for the Advancement of Research on Conflict and Collaboration at Syracuse University. It is based on a workshop conducted on July 23, 2012, in cooperation with the U.S. Embassy, Tel Aviv, and includes contributions by Prof. Miriam F. Elman, Attorney Gilead Sher, and Prof. Daniel Bar-Tal. “Nonpartisanship, Interventionism and Legality in Accompaniment: Comparative Analyses of Peace Brigades International, Christian Peacemaker Teams, and the International Solidarity Movement,” in The International Journal of Human Rights, 2012 (vol. 6, no. 7), p. 963-981- This article was published by PARCC Alum Patrick Coy, who is Professor and Director of the Center for Applied Conflict Management at Kent State. Collaboration Across Boundaries: Insights and Tips from Federal Senior Executives (IBM Business of Government, 2012) - Rosemary O’Leary, Professor of Public Administration, and Catherine Gerard, PARCC Director, have published a report based on survey responses from over 300 members of the federal Senior Executive Service. This report provides valuable insights into how federal senior executives view collaboration. Survey respondents clearly recognize that the job of senior executives today involves collaboration within their agency, their department, and the federal government, as well as with key external partners and stakeholders. The report presents valuable insights into why agencies collaborate, the barriers to collaboration, and the skill set needed to be a collaborative manager. Download the report free of charge (PDF). Rosemary O'Leary was interviewed about this study on Federal News Radio on "In Depth with Francis Rose." Listen to the interview. Systems Research and Behavioral Science Special Issue: Collaborative Problem Solving Amid Conflicts. PARCC Director Catherine Gerard and former PARCC Visiting Fellow Ya Li (Professor of Public Administration, Department of Public Management at Beijing Institute of Technology) are two of the co-editors of this volume. In addition to writing the " Opening Editorial for the Special Issue," they co-wrote " Learning from Conflict Resolution: An Opportunity to Systems Thinking" with Zhichang Zhu (University of Hull Business School). Louis Kriesberg also wrote an article for this volume, " Mediation in Conflict Systems." Adopting the notion of “third world” as a political and geographical category, this volume analyzes marginalized women’s experiences of globalization. It unravels the intersections of race, culture, gender, ethnicity, nationality, and class that have shaped the position of these women in the global political economy, as well as their cultural and national history. In addition to a thematically structured and highly informative investigation, the authors offer an exploration of policy implications, which are commonly neglected in mainstream literature. The result is an invaluable volume for scholars in the fields of sociology and women’s studies, social policy experts, and professionals working within non-governmental organizations. Edited by Ligaya Lindio-McGovern is professor of sociology at Indiana University. She is the author of Globalization, Labor Export and Resistance: A Study of Filipino Migrant Domestic Workers in Global Cities. and Isidor Walliman is a visiting research professor at the Maxwell School, Syracuse University. He is the coeditor of On the Edge of Scarcity: Environment, Resources, Population, Sustainability, and Conflict. Climate Change and Threatened Communities: Vulnerability, Capacity, and Action (Practical Action Publishing, 2012) - Co-edited by A. Peter Castro, Associate Professor of Anthropology and PARCC Faculty Associate. Global climate change disproportionately affects rural people and indigenous groups, but their rights, knowledge, and interests concerning it are generally unacknowledged. Shifts in precipitation, cloud cover, temperature, and other climatic patterns alter their livelihood pursuits and cultural landscapes, accentuating their existing social and economic marginalization. This book argues that planners and researchers of climate change mitigation and adaptation must take into account the knowledge and capacity of rural people, and engage them as active participants in the design and governance of interventions, not as a matter of courtesy, but because it is their right. Furthermore, inclusion of local communities in genuine partnership will likely make climate change adaptation and mitigation efforts more effective. The volume presents 15 case studies and a variety of approaches to document the capacities and constraints to be encountered among communities facing changing climates in Bangladesh, Cameroon, Canada, Ecuador, Ethiopia, India, Indonesia, Italy, Malawi, Mexico, Mozambique, Peru, South Africa, Sudan, United States, Vietnam, and Zimbabwe. "A Manager's Guide to Evaluating Citizen Participation"
PARCC Faculty Affiliate and Associate Professor of Public Administration, Tina Nabatchi authored, "A Manager’s Guide to Evaluating Citizen Participation," which was just published by the IBM Center for The Business of Government. This report provides a practical assessment guide for government program managers so they can assess whether their efforts are making a difference. The report lays out evaluation steps for both the implementation and management of citizen participation initiatives as well as how to assess the impact of a particular citizen participation initiative. An appendix provides helpful worksheets, as well. Constructive Conflicts: From Escalation to Resolution, 4th edition - Louis Kriesberg, Professor Emeritus of Sociology, Maxwell Professor Emeritus of Social Conflict Studies, and founding director of the Program on the Analysis and Resolution of Conflicts and Bruce W. Dayton, Associate Director, Moynihan Institute of Global Affairs and Co-Research Director of the International and Inter-State Conflicts Program at Maxwell’s Program for the Advancement of Research on Collaboration and Conflicts (PARCC) have published the fourth edition of this comprehensive and highly regarded book, which provides a framework for analyzing diverse social conflicts. The Right to Water: Politics, Governance and Social Struggles (Routledge 2012). Farhana Sultana, Assistant Professor of Geography, co-edited this volume, which brings together a unique range of academics, policy-makers and activists. The book analyzes how struggles for the right to water have attempted to translate moral arguments over access to safe water into workable claims. Professor of Anthropology and International Relations, Robert A. Rubinstein's co-edited book Dangerous Liaisons: Anthropologist and the National Security State, has been published by SAR Press. In the context of heightened efforts of government agencies to marshal anthropological assistance in understanding terrorists' motivations, stabilizing nascent wartime governments and counter insurgencies, Dangerous Liaisons brings together an international group of distinguished scholars to explore relationships among military and intelligence agencies, the work of individual anthropologists and anthropology as a discipline. Conflict Transformation and Peacebuilding: Moving From Violence to Sustainable PeaceEdited by PARCC associates, Bruce Dayton and Louis Kriesberg, Conflict Transformation and Peacebuilding examines the causes of escalation and de-escalation in intrastate conflicts. was published by New City Publishers which is supported by The Writing Program, Syracuse University and The University Writing Program, Temple University as part of the Reflections Series. Click here to read more. The book is titled Pushing the Boundaries: New Frontiers in Conflict Resolution and Collaboration and is authored by Rachel Fleishman, Catherine Gerard, and Rosemary O'Leary, Editors (Emerald Group Publishing, 2008). PARCC Visiting Research Professor Isidor Wallimann is the editor of Social Policy According to the Polluter Pays Principle: Examples of Application in the Field of Addiction, Obesity, Abuse of Medicine, Unemployment, Prostitution. Published in German, the book is based on his previous (theoretical) publication exploring the potential for applying the polluter-pays principle to social policy and problem management. The application in social policy is strongly influenced by the tradition to apply the polluter-pays principle in environmental policy. Wallimann was also recently interviewed on the commercial role of applied research and its relationship to "pure" research by swissinfo.ch. by Louis Kriesberg in The Sage Handbook of Conflict Resolution. Sage Publications. by Louis Kriesberg in Peacemaking in International Conflict Methods & Techniques. United States Institute of Peace. by Louis Kriesberg in After Mass Crime: Rebuilding States and Communities. United Nations University Press. by Louis Kriesberg in Unleashing the Dogs of War, Conflict Management in a World Divided. 2006 Rubinstein, R. A., Approaching Racism: Attitudes, Actions, and Social Structure, In Racism in Metropolitan Areas, Rik Pinxten and Ellen Preckler, editors. London: Berghahn Press, Pp. 93-100.